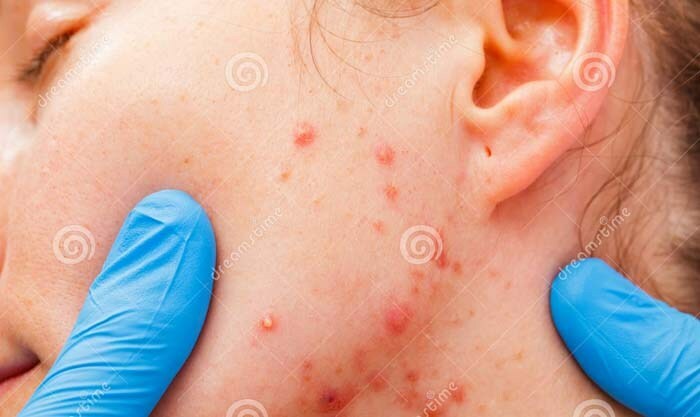 Home Acne Types What Are Papules and Pustules? The two most common types of inflammatory acne are papules and pustules. When a pore clogs and P. acnes bacteria multiply in the pore, the immune system reacts by sending in white blood cells to fight the infection. The surrounding area becomes inflamed, red and swollen. This is called inflammatory acne. It is different from blackheads or whiteheads, which are types of acne that are not characterized by redness and inflammation. Getting rid of papules, pustules and all forms of acne begins with a daily skincare regimen that includes an acne active treatment. Many people can benefit from a daily, consistent acne treatment to help get rid of papules and pustules and prevent future breakouts.